No manufacturing! So the entire market cap less cash is the brand value. Something like1.1B dollars for a single product manufacturer. In comparison IPL has brand value of 5.5B dollars and Maruti of 4.4B. So does Nike, Addidas and many great companies around the world. Reaching a scale without manufacturing it yourself is more difficult to achieve. Never questioned the business model. Very possible and many must be doing it globally. I doubt the brand valuation the market is giving. Accounting basics - Excess of book value is goodwill. If there is no PP&E, then everything is goodwill minus cash in hand. Is SYPHONY brand really worth more than a billion dollar? That is what I questioned. Disruption Sir. Soon, more cheaper A/C, higher ambitions, better & cheaper availability of electricity. Of course one can try and of course there will be deviations (in fact it is always there) - that is the nature of any type of forecast. As I said, at best these projections are rough guidelines for me and not gospel truth. Earlier I used to follow estimates from various brokerages to see how the business is going to pan out over the next few years. However, as time passed I realized these are just some values put in an excel sheet and extrapolated the hell out of. So many times analysts have missed estimates on the companies I’ve been invested in by a mile - Kitex, Kaveri, Ajanta, Indigo, Symphony (in this case) etc to name a few. Somehow, I feel these numbers are mostly quite optimistic and also disregard how real businesses move over the years. Very few businesses move in a linear fashion and whenever they are off the mark - analysts change their EPS estimates, valuation they assign to the business, change price targets (drastically) and push everything forward over a year or two. And this happens every year literally. Personally, I only like these reports for the way they explain the industry, business model of the company, its advantages (moats) quite well. Any future projections are taken with a pinch of salt by me due to the poor experience I’ve personally had with these projections. While DCF helps to a certain degree as it helps hazard a guess on where a business could be 10 years from now. But the catch is, things seldom move in a linear fashion. So for me (personally) projecting out 15-20 years from now is just not practical and out of touch with reality. 1)Symphony has a good management and I think we all would agree to that. Forecasting and trying to value is no doubt a crucial excercise but in these calculations we can never value the ability of management. We can never value their future strategies , their future business diversifications. I wont comment anything on the price and value ,a lot has already been discussed about it. Even temperatures in UK were higher . I think these are huge untapped markets which symphony may explore. I think a DCF is the best way to Value a company. You may feel like using a Price Multiple kind of Valuation. That’s not my point of contention. My point is that any estimate of Value is in from the future and hence, contains some amount of uncertainty. Regarding assessing a Company’s Moat and Management Quality, Valuation comes after all that. Valuation is the final frontier, where you feel like you can justify your every assumption based on facts / reality. It’s not the other way around. Or you could disregard Valuation completely and invest based on Moats and Management Quality alone, which in my opinion in speculating. To clarify, I don’t disregard valuations completely - that’d be foolhardy. Though again, I don’t rely on them blindly and base my decisions on it purely. As things stand for me, Symphony at the current juncture is fairly valued (my fair value DCF assumption is Rs.1100 - 1200). Any opportunity to add this business at lower valuations will be even better. Even from a PE ratio stand point, the business looks fairly valued to me. For me the main determinants of the PE ratio are Growth (the business has a decent sized runway and can grow at least ~15% for the next 5-7 years), capital required to run the business (the company generates great cash flows, so should be able to self sustain), level of debt (zero), risks associated with the business (weather, tech disruption, competition (they are clear #1’s in this industry) etc.) and quality of management (gold standard for me). I believe considering all this the market is assigning it the valuations it trades at. However, all this aside. For me the thing is simple. Mgmt has ‘X’ opportunity size available to capture. Are they a capable enough management to grow from where they are to where they ought to be (say for doubling sales and profits in the next 4-5 years?). To me, I think they’ll get there. As long as they get there valuations and other parameters will take care of themselves. The real spanner in the works would be if they fail to get there. In such a case no matter what your MOS is or what your DCF model suggests as fair / great value is a moot point as all these assumptions are based on the business growing. And if it fails to grow, as an investor I’m looking at sub par returns and wasted years (opportunity loss). The only thing that matters to me as an investor are returns and this is only possible through growth in sales and profits. Right, fair or wrong valuations will only increase or decrease my returns by a few % points during this period basis how the market ends up viewing the business, the mgmt, its earnings, free cash flows and finally its future prospects. The real spanner in the works would be if they fail to get there. In such a case no matter what your MOS is or what your DCF model suggests as fair / great value is a moot point as all these assumptions are based on the business growing. Which has literally nothing to do with Valuing a company. Even the best investors in the world would kill to have that kind of foresight. But this uncertainty shouldn’t discourage us from making an informed guess. I was simply replying to your point about Valuations being all over the place. It’s in the nature of projections. This assumption can turnout to be very expensive depending on what you consider as few % points. Over the last 4-5 years, most of the movement in stock prices of small and midcaps in India is due to change in valuations rather than change in earnings and other fundamentals. 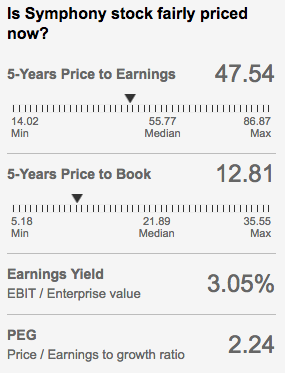 Over last 5 years, EPS has grown at a healthy CAGR of 21% but price has gone up 50%. More than half of price growth has come from PE expansion from 14 to 44. All the PE expansion happened in 2013 and 2014. Once PE reached 48 3 years ago, price growth reduced to 3%. earnings growth has steadily dropped as well. Over next 5 years, if PE dropped 10% each year, it will reach 25 in 2023. If earnings grow 15% each year over this period, stock will give you a paltry 5% return with plenty of nerve wracking volatility. Is it worth it? Can you share your DCF valuation.sheet for symphony?? The PE multiple could possibly drop to 25 or infact lower if market’s perceptions about the company continues to deteriorate in the future. Perceptions will deteriorate if the company’s growth rate keeps on falling. And the growth rate will keep on falling if summer months keep shrinking in India, there is structural movement of cooler customers to AC etc. With the company trying to increase geographical footprint both domestic and international, rising disposable income, advancement in technology, trusted management etc., number of coolers sold(x), price/cooler(y), and net profit margin(z) will continue to be on upward trajectory. So xyz=Net Profit will continue to grow. Given zero equity dilution and debt history, EPS will continue to grow. Hence PE ratio should be stabilized in the coming years. Yes, that is true. If the scenario plays out the way you describe all the latest investors in Symphony are looking at sub par returns. However, what makes you say the company will get derated to 25 PE? Why not 15-20 PE - thereby actually reflecting the speed it may grow at? To me all this will happen only if the company falters on its growth and promise to grow badly. If you look at the industry it is in, the company is pretty much quoting around similar PE ratios that other white good companies are trading at. In fact, most consumer facing businesses with strong brands, market leadership and mediocre growth are trading at PE ratios that makes no sense. However, that is the premium market is assigning to such secular growth stories in India. In fact, in 2013 when I started investing in stocks directly I missed out on great companies like Eicher (32 PE then), Page (38 PE then), Procter and gamble hygiene (35 PE then) just because I freaked out looking at the PE ratio. All these businesses have show decent earnings growth over the last 5 years coupled with them getting re-rated. Now of course they may get de-rated again, however to me its an opportunity to invest more in such secular growth stories if the valuations actually cool down. So in all honesty, in theory it makes absolute sense to invest in companies at lower PE ratios growing at a fast clip, with a great moat, super management, great ratios, free cashflows and the works and one will definitely make better monies when the PE of the company actually re-rates. However, it is hard to find such opportunities in practice. Industry has faced two consecutive bad summers. Will this pattern of “bad summer” continue? My guess is as good as anyone’s guess. Difficult times lead to 1) consolidation in the industry 2) weaker players (mostly unorganized) are shaken out 3) strong players emerging even stronger when industry prospects rebounds. If I assume a normal summer in 2019, there are good odds Symphony can achieve FY2017 standalone PAT of 173cr. Plus subsidiaries may contribute 50cr (australian acquisition is eps accretive right from day 1 and mexico and china businesses are turning around well) bringing consolidated PAT to around 220cr. We are getting Symphony at PE of ~35 (7790/220), IF we have a normal summer next year. Now we have to make a guess of what future returns can be given current valuation and whether that expected future return is acceptable given individual’s return requirements. As management has mentioned, with their diversifying revenue sources (Australia, USA, Mexico, China) revenue contribution from subsidiaries will be close to 45-50% in 4-5 years making company less dependent on Indian summer. Personally, I don’t invest just looking at PE. It’s a short-cut for dumb valuation. But felt to share my thoughts on PE as it was being discussed in few of the above replies. @bharat.jain I used to calculate the DCF value using a simple excel sheet I had created after reading Pat Dorsey’s “The Five Rules for Successful Stock Investing”. However, I’ve never been confident whether I’m putting in the right values and if I’m getting the estimate near the ball park it should be at. However, whenever I did use it - I noticed my values were always around fair values that these two websites displayed - morningstar and marketsmojo. In fact, in many instances Morningstar’s fair DCF value of the company was far more conservative than the numbers I was getting. So, I tend to use these two websites a lot to see what might the fair value of a company. This is I couple with various other ratios like PE, PEG and Earnings yield. It is not exact always, but if you’ve been reading my comments above - I really don’t believe valuations are an exact science in any case. It is a contentious issue and will always remain one. have just started tracking symphony and this forum has helped me a lot in understanding the company…one thing which got me worried is their investment portfolio: as per BSFY18 they have invested: 21 cr in IL&FS, another 7 cr in wondrous mart, looks like a RE company in noida, 30 cr+ in JM financial, 10 cr in edelweiss, 10 cr in IIFL, abt 55 cr in corporate debt fund. The whole sector has been struggling owing to two back to back bad summers, so the problem is not company specific. Instead, Mr. Bakeri mentioned that company’s market share has rather increased as Symphony was better placed to see through the bad season. In the last con-call he mentioned about the company seeing increase in number of dealers/distributors as the company’s product off-take was relatively better than other companies. The dealers have placed good orders for the off-season. There was a question in the con-call about the reason for current liabilities going up by 100+crores. It was clarified that those were the advances from customers for orders yet to be executed. Management was quite optimistic on Climate technologies, recently acquired in Australia. Though, Mr. Bakeri didn’t name them, he mentioned that the company has good business not only in Australia but also outside, in that region. So, it can be scaled up. This would further reduce company’s dependency on erratic summers in India as the seasons in Australia and thereabout are opposite to that in India. Operations in China have done really well, showing signs of a sustainable turnaround. Inventory levels with the company are back to normal levels as mentioned in the con-call. Though nothing committed, the management indicated and mentioned about buy-back at an appropriate time, given the company’s reserves and free cash flows. Mr. Bakeri mentioned that they are not eyeing a specific acquisition at this stage. One of the analysts asked if the buy-back (whenever it happens) would be a small one or of a significant size (which I thought was an irrelevant question as its not committed yet), however Mr. Nrupesh Shah replied saying it would be of a decent size whenever it happens !! Other than for the poor numbers, when asked, the management sounded ‘not so confident’ about taking over market share from the unorganized sector which it seems has been assumed and over-simplified across sectors as a result of GST. Mr. Bakeri called it ‘elusive’, so it seems the unorganized sector are still having it their way. According to him, this is anyways a slow and gradual process than expecting things to happen overnight. Sep and Oct sales high in both volume and value compared to earlier years. In the scheme of things these amounts are smaller compared to amounts made in summer. 75% of distributors have invested in off-season despite erratic summers of 2017 and 2018. Inventory at company level is back to normal, unlike apprehensions expressed by analysts in the past. Inventory on standalone basis is down to Rs.41 crores viz-a-viz Rs.51 in Mar 2018. Advances have been received, in case of many models there is negative stock. Production across OEMs is also back to normal levels and production is going on in full swing like earlier years. Business remains capital light, asset light. Still dealing with trade on 100% advances – this remains intact. Like earlier years company is enjoying 90% market share in off-season. Some trade incentives offered to trade in some parts due to erratic summer. This has led to some decline in gross margins. Company confident that they will achieve growth on a sequential basis (i.e. growth over Sep 18 qtr). Though it will be lower than Dec 2017 performance. Journey towards Version 3 progressing well. It will be volume led value creation without compromising the business model – asset light, capital light, working capital light. Climate Technologies (CT) Aus part of the financial results for the first time. CT contributes ~16-17% to the top-line in the Jun and Sep qtr. The other two quarters it contributes 65-70% of the top-line. Hence, the current quarter performance is in line with the original business plan and the companies estimate. Financials: Review the announced company results for details. How is the growth trend in bookings vs last year? Will special incentives be done away with in subsequent quarters and thoughts on gross margins? Performance of subsidiaries? More than 75% of distributors have participated in off-season booking with 100% advance payment. Company comfortable with 50% gross margins and company will be able to maintain that. Aims to do this in Dec quarter. Mar quarter too early to say if it will be higher. GSK China: Sales 36 crs (from 27 crs) / EBITDA +7.4% (-8% last year). Most turnover for GSK China is Mar and Jun quarter. Dec is a slow quarter. Inventory level at the distributor / retail (trade) level? Write-off on IL&FS? As Sep and Oct had temperatures more than 38 degrees, there have been decent sales as compared to earlier years in many parts of the country. In absolute value, it doesn’t amount to much. Overall, most secondary sales happen in Feb to Jun. Hence, trade will be sitting on reasonable level of inventory. Despite this, trade has shown faith in the company and has done advance bookings in off-season. Total exposure: 21 crs. Write off for 4 crs. 1 crs dividend not shown on books as well as good accounting practice. This is the maximum possible write-off recommended by the auditors at this point in time. It’s possible they may have write off the whole thing if it is non-recoverable over 12 qtrs. If resolution is there, they may write it back too. Inventory level at distributor same as last year? New launches? It is certainly much higher than last year. Inventory has been carried forward from summer. Whatever has been sold has been the earlier inventory. New launches bound to happen as that is a constant at Symphony. Nothing changes there. Thoughts on strategy to get more share from the unorganized sector? Thoughts on competitive behaviour? Exports from India? How to do so is elusive. Can’t compete with them on pricing. What the company can do is offer better products, features, service and assurance of a brand. These factors over time will lead to shift from the unorganized sector to organized sector. This will continue and will be a gradual shift. Bringing a product just priced slightly above the unorganized sector may not really make a difference as it is not a matter of the product alone. Any organized player incurs costs on logistics, on after sales service, network etc. Each layer adds on to the cost. The unorganized sector guys may be local and hence may not have to incur these things. Company has heard that few of the marginal players are facing cash crunch or maybe contemplating an exit from the category itself. Won’t comment as the company is not completely sure of it. Time will tell how the future plays out. Exports haven’t grown the way the company would have liked to. Company taking measures on pricing, product and distribution to address this. In the next year or two the company should see a significant improvement in their performance. Cost of debt of Rs.130 crores? This debt is for purchase CT. Total acquisition cost was Rs.215 crs. Rs. 85 crs has been funded by way of equity from Symphony India. Rs. 130 crs is long term debt availed in AUD and it has been hedged for the entire tenure of the loan. Costs inclusive of everything is ~5.30% p.a. Not funded through existing cash as (a) it gives some interest cost arbitrage (b) it gives a natural hedge in forex itself c) they plan to pay-off the debt from the cash flow of CT itself. Strategy for the existing cash present on the balance sheet? Any other acquisitions on the horizon or are you looking at buy back? May look at buy back down the line. No other acquisition being looked at the moment. This on account of advances received from trade and it is yet to billed as on Sep 30. Performance of centralized air cooling? They are growing y-o-y. Have got some marquee clients and have in fact even installed such solutions in competitions office! Optimistic about the category in medium to long term. Significant growth achieved y-o-y (from a small base). No competition being seen in this category. There maybe a few local manufacturers. Question from an individual investor (he really grilled the management – loved it!) Aiming for growth of 20-25% top line growth in the medium – long term. But growing at ~12-13% or so over the last 4 years? Thoughts on cash on books? Company maintains on a CAGR basis it will grow at the projected pace in the medium – long term. 40% will come from exports. 60% will come from India. And this will remain the trend going forward too. Cash on books impacting ROCE hence company has bifurcated the ROCE of coolers business and treasury (in the results) so that they are able to maintain focus on the core business. Cash will be used for buyback as it is more tax efficient and the same will be done at the right time and the size of it should be decent basis the norms that have been set by the regulator for the buyback. Thoughts on the Indian industry? The entire industry has de-grown (organized and un-organized) including Symphony in H1FY19. 15%. Has grown from 5% 3-4 years ago. Cash is building up on the books and the management will do a decent sized buy back in times to come. Definitely a thing to monitor. Company desperately needs a really warm summer in CY 2019 to get the growth back on track and to ensure all the inventory gets absorbed. Another bad summer and the stock price may plummet even further. Though, it will most certainly shake off a lot of the weaker players out of the industry. If the company is indeed invested into these stocks, they need to quickly change the treasury policy so that all surplus cash need to be invested into safe debt funds only.